Numerous reports of clown sightings have created alarm throughout towns in the southern region of the United States, and for one Kentucky town, the sighting resulted in an arrest. Police in Middlesboro arrested Jonathan Martin, 20, after his suspicious behavior near a wooded area attracted the attention of Barbourville officers on Sept. 23. Martin was wearing a clown costume and seen crouching in a ditch as he tried to scare people. He has been charged disorderly conduct and cited for wearing a mask in a public place, reported WKYT. He also had two warrants for non-payment of fines and for failure to appear for arraignment. He is being held at Bell County Detention Center. 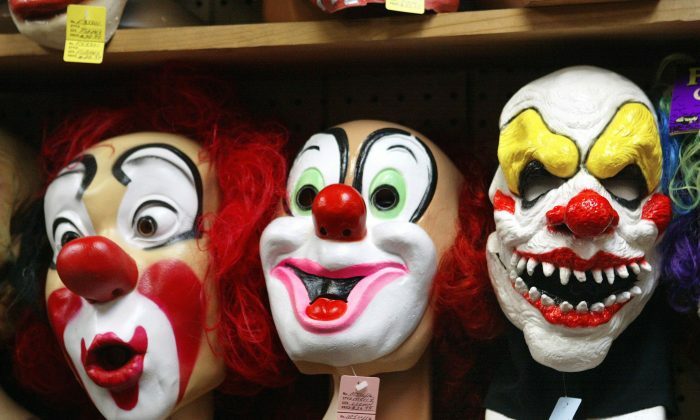 The police department have received several complaints about clown sightings, according to its Facebook page, adding the prank has “created a real concern and risk” to its citizens. There have been several clown sightings throughout towns in Alabama, North Carolina, South Carolina, and Georgia, where clowns have made attempts to lure children into the woods. On Sept. 21, an 11-year-old Georgia girl told school officials that she carried a knife to school to protect herself from clowns in the area. She was charged with weapon possession on school grounds and released to her mother. The latest clown sighting was in Palm Bay, Florida, where a woman said she seen two clowns while walking her dog. Greenville Police Chief Ken Miller said in a press conference on Sept. 1 that he wasn’t sure of the motives of the clowns—whether if was connected to the new film, “31”or to “somewhat politely terrorize the public,”—but he wanted the mischievous behavior to end.